If not already on your list of top things to do in Portugal, one definite must do is treating yourself to some delicious Porco Preto. This melt-in-your-mouth pork of the unique Iberian black pig is some of the best pork you will have in your life! It’s funny how you know of a product like Iberian ham: that it’s expensive, and tastes incredible. But, you actually have no idea where it comes from and why it is so delicious. After visiting the Alentejo region in Portugal where the Porco Preto actually comes from, I decided to do some more research and try to explain it all to you. Easier said than done as there are many articles with different explanations. We mixed them all together and this is what we think is true. What is a Black Iberian Pig? 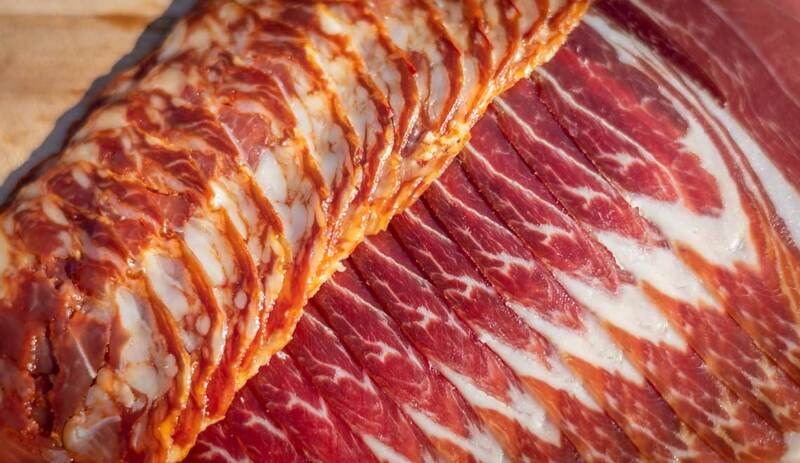 The start is easy: an Iberian pig comes from the Iberian Peninsula, which consists of Portugal and Spain. They are native to the Iberian peninsula and mainly live in the central and southwestern region of the peninsula. Then comes the black part as this particular type of pig is black. There isn’t one straightforward conclusion as to the origin of the Iberian pig. 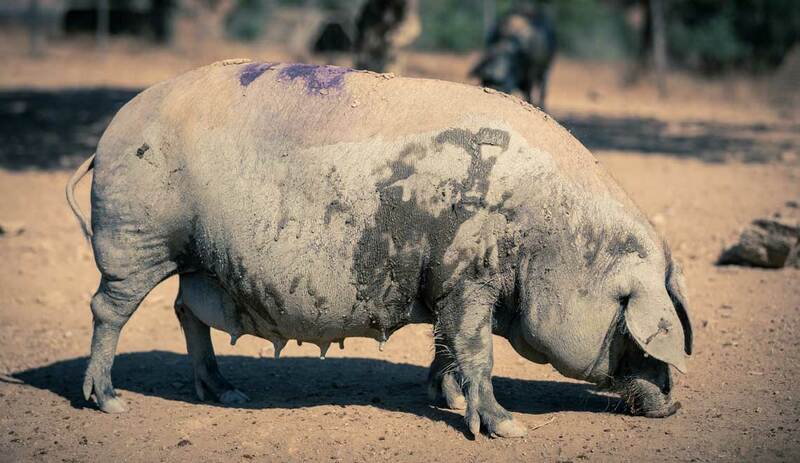 The most likely explanation is that it’s a cross between white pigs and wild boars and that’s why it’s black. This called for some reading up on the differences between pigs, hogs, boars, and swines. Well, turns out they are essentially the same animal with a few small distinctions, such as weight, how they live, and length of the nose. For example, you call a pig a hog if it is 54 kg or more, and you call it a boar if a pig is not castrated or living in the wild. The Black Iberian Pig distincts itself with its black color but also the long snout. 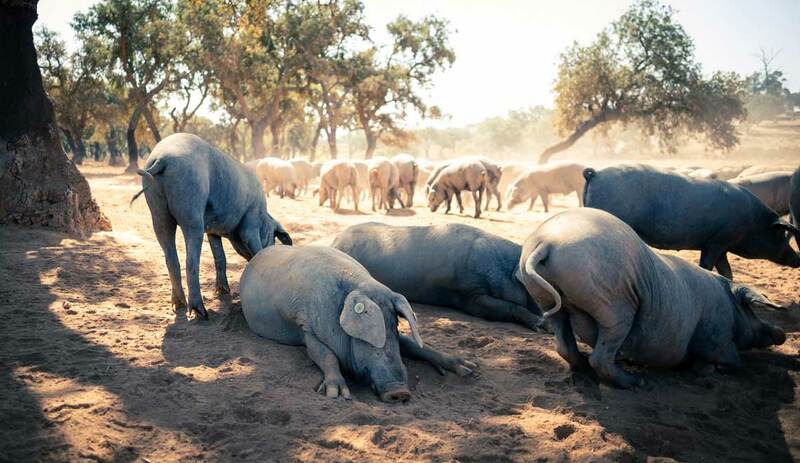 In Spain, you find the Black Iberian Pigs in Extremadura and Huelva regions, and in Portugal in the Alentejo. Essentially it is the same animal. We learned that actually most of the Portuguese Porco Preto are being exported to Spain to meet the high demand. Portugal apparently has more more (Azinheira) oak trees than Spain. The (bulota) acorn from these trees is essential for the proper taste. The Spanish buyers blood test the animals to make sure of this. In Spain, you call this pig cerdo ibérico and in Portugal Porco Preto. Sidenote: in the English language, the meat of the pig is called pork, not the animal. In Portuguese, a pig is called porco. A bit confusing, right? When you make a ham of the Iberian Black Pig, it is called Pata Negra in Spain, and in Portugal, it is called presunto of the Porco Preto. Porco Preto can also be called Porco Alentejano but I’ll get back to that later in this article. The Iberian black pigs roam free in oak forests and eat only acorns in their fattening period. Iberian black pig is considered top quality meat because of the significant flavor due to their unique diet of acorns. There are great cuts to consume, all very flavorful but the most popular are the hams (in Portuguese: presuntos). These are among the most expensive hams in the world! Lucky for you, in Portugal, the meat of the Porco Preto is quite affordable. The meat of the Porco Preto is mouthwatering, melt-in-your-mouth, intensely flavorful, and a bit nutty. The longer it’s cured (preserved in salt) definitely makes a difference. Eating a regular ham and a Porco Preto side by side is just unfair. Within just months they move to the oak forests where they are allowed to roam free which makes them burn calories and provide for fine bones. They feed themselves on acorns, which give the meat a little nutty flavor, but also several herbs and grass. When you see the meat structure you immediately notice that the acorn diet made the meat structure marbled with fat. It’s key to the succulent and tastiness of the meat. And best of all, it is actually healthier than other pork! Popular meat cuts are the hams and chorizos. But, I also recommend any other cut of meat of the black pig. In Portugal, I particularly like the ‘plumas’ and the ‘secretos’. When you prepare the meat it doesn’t need much seasoning because of its unique flavor but I definitely recommend using a grill as it provides that extra taste that matches perfectly. The central and southern regions have the best ecological system for the Porto Preto. The Alentejo makes up most of that region. That particular Porco Preto is commonly referred to as Porco Alentejano and even has its own certificate. The Alentejo is known as the garden of Portugal and is a large, wide open region with lots of space to roam free and the perfect climate for the oak trees. There is even a Proco Preto producer in the Algarve in the Monchique region, where you can buy the meat from a local store. We still have to visit there. Ourique is the self-proclaimed capital of the Porco Alentejano. It is home to the ACPA, which is an organization promoting and preserving the Porco Alentejano. Driving in and around Ourique, it is unlikely that you will see any Porco Preto walking around. The farms are quite far from the main road and somewhat hidden. Luckily, the ACPA provides tours to the farms. Afterward, we went to the Montado, which is the name for the particular countryside with a unique ecological system perfect for the Porco Preto. When the pigs are old enough they come here to roam free and fatten up. The fields are full of holm oaks and cork trees. Remember, this is where the unique flavor of the meat comes from. The pigs will eat as much as they can of the acorns (from the holm trees) and the seeds (of the cork oaks). The secret that makes these pigs so special is that they get a nutty flavor because of the acorns and also causes them to fatten from the inside. If you like to tour the farms too, you can contact the ACPA. They are working hard to promote Porco Preto in Portugal and happy you are taking the time to learn more about it. Afterward, try one of the restaurants in Ourique that serve the Porco Preto. We recommend Ageda do Monte Velho, which is simple, affordable, yet incredible and they serve huge portions! As we learn more about the Porco Preto and visit other regions, we will update this article. If you have anything to add, please let us know.